Garments made from this yarn will not shrink or fade. Machine Wash using warm water and any laundry soap or detergent. Tumble dry. Launder dark colors separately. 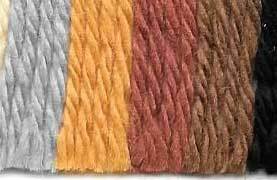 Note: Mousam Falls is also available in 100 gram hanks (approx 185 yards each). These are sold in bags, not as separate hanks. Contact us if you are interested in hanks not cones.